31 states are considering 144 policies to protect people from toxic chemicals. 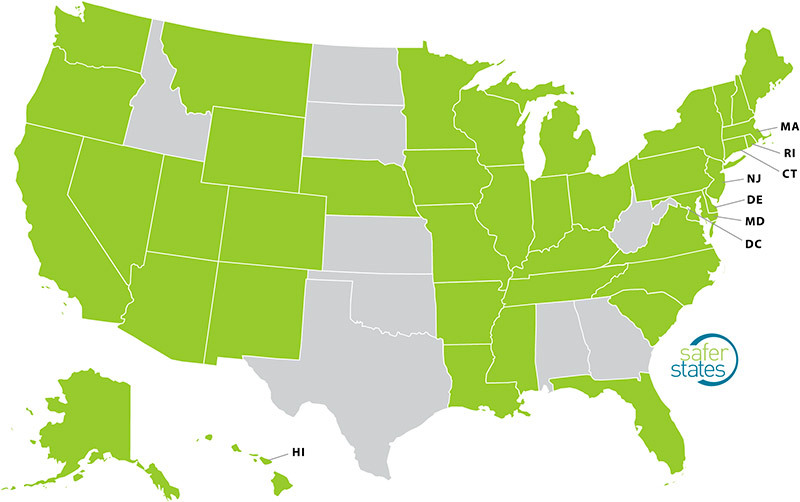 182 state policies have been adopted in 35 states. Click on a green state to learn about policies to keep people safe from toxic chemicals that harm our health. Steering the nation towards a healthier future. For over a decade, Safer States has united state advocacy groups to pass common-sense policies that keep harmful chemicals out of our food, water, and air. Together, we are building a future in which everyone can count on safe products, clean water and healthy communities. This Earth Day, we look back with hope on progress from the last year. Click here to learn more about how retailers can help protect us from harmful chemicals. View all bills for Washington D.C.